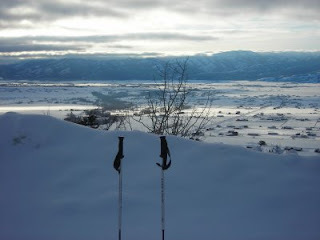 January here in Teton Valley, Idaho has felt like about three months compressed into one. Thirty-one days probably has something to do with it, but a wild swing in weather patterns, events and moods has contributed equally. Blizzard conditions early, then below-zero cold, then an unseasonable week of forty degrees and blue sky, followed by more storms...oh yeah, with a Presidential Inauguration and continued volatile financial markets thrown in for good measure. Which way is up anymore, anyone? At last, this weekend was a moderate, normal-ish finish to the month. Normal feels nice after swinging between such extremes, in more ways than one. 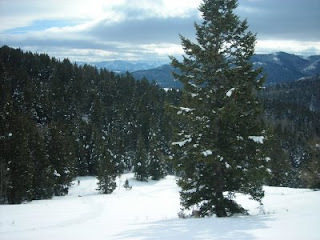 It may sound like an oxymoron, but for me, venturing outside brings internal equanimity. Purposefully disconnecting can really make you more connected. For such an approach, there's no better place than the mountains around Driggs. 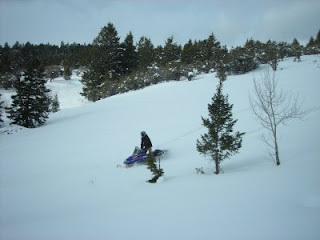 Snowmobiling, skiing, hiking, biking, breathing, thinking. Pursuits for which we're much more evolved to handle, and which rightfully ought to occupy more of our time than sitting at computers, fighting rush traffic, and figuring the price of oil. More of this, and less of that. 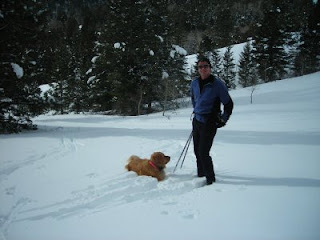 Deep snow, wide open spaces, and a backcountry outing with the dog. It doesn't get much better. The Super Bowl (our unofficial national holiday) was even a good game, although I was admittedly pulling for the underdog Cardinals. Happy February, everyone...and here's to a smoother road ahead, everywhere.